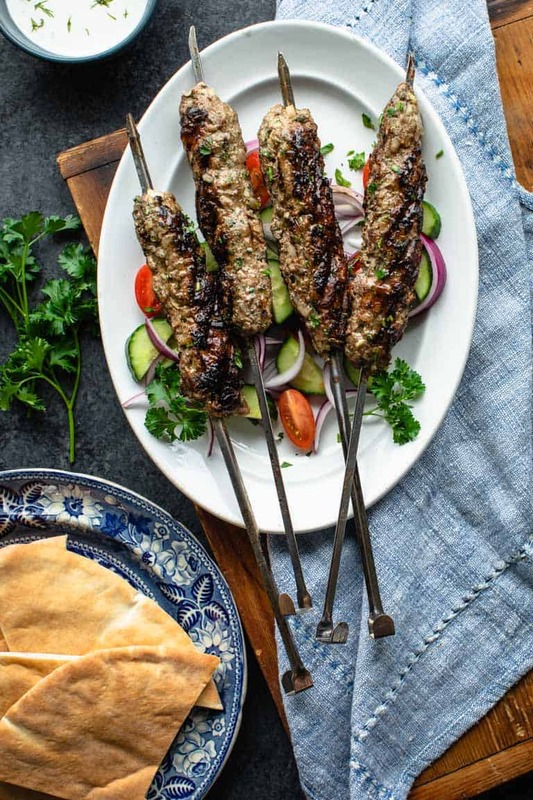 Here’s a recipe for simple Grilled Lamb Kofta Kebabs made with onion and spices and then shaped and skewered. They are a grain-free and paleo entree for the spring grilling season. I originally shared this recipe on April 26, 2015. I have updated the images and some of the text today. It is not that I am disorganized; I just tend to forget about things if they are out of sight. Out of sight out of mind. That is me. To stay organized I have piles. Lots of them. For example, to my right I have a clipboard with a hand-written list of things to do. To the right of that is a pile of open bills that need to be paid. Trust me, I don’t let those get out of my sight. I will forget about them. I know it is crazy, I just forget. Directly in front of me, under my monitor, is a pile of recipes that need to be edited and blogged about. Then to my left I have a row of vertical cubbies with 6 piles! Each has its own theme. There’s the Maggie’s Brightside pile (I am on the board), the To-Be-Filed pile, the Taxes pile and so on. It is kind of dysfunctional, but functional at the same time. 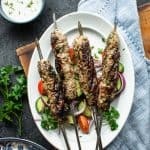 The reason I am bringing up the piles today is that somehow when I first posted this Grilled Lamb Kofta Kebab recipe in ’15, I had actually developed the recipe an entire year before! How could that be when this pile system of mine seems to be completely and utterly foolproof (hah!!) Crazy, I know! How could that be? One of the great thing about this Kofta is that it doesn’t have any breadcrumbs or wheat in the meat mixture, so it is gluten-free, whole 30 and paleo! It’s important to mix the onion with the other ingredients before adding the lamb. That ensures the spices are evenly distributed, and the meat doesn’t get overworked when kneading in the seasonings. If you are not a fan of lamb, then try this with ground venison or grass-fed beef. Please note that ground turkey and chicken are too soft to hold together when you are grilling them, so I don’t recommend using them. Once the meat is mixed in, divide it into four portions. Then shape into sausage shapes with your hands and run a skewer through them. 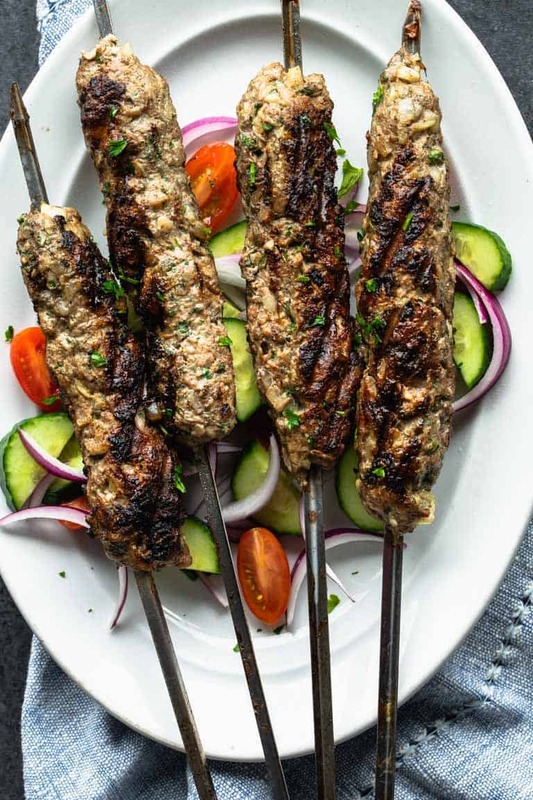 If you have a flat skewer like the ones in this photo, use those, because they’ll help keep the kofta from rolling as you try to turn them on the grill. Get your grill nice and hot, and be sure to brush it off. Right before you place the lamb kebabs down, run an oil soaked paper towel along the grates. You’ll want to use a set of tongs and be sure to pull the towel toward you in case there is a brief flare up as the oil drips down. Oiling the rack will help to prevent the kofta from sticking. Add the lamb to the grill, and let it sit without turning until it releases from the grill. It may stick a tiny bit, but if you are patient, it shouldn’t stick very much. Use a spatula to help loosen any areas that stick. You can serve these kofta on their skewers if you like. Or if you want, you can remove the skewers and slice them into large bite-sized chunks. Home-made tzatziki is a really wonderful accompaniment. Or if you’re in a rush, even serving with a dollop of plain full-fat Greek yogurt is also delicious. Serve warm pita or flatbreads. There are some great gluten-free ones if you are gluten-free. Cucumbers are a great addition. You can make this simple cucumber salad or if this 15 minute chopped Greek Salad. For something a little unexpected, you can make this lemony carrot salad. Hot Moroccan Carrots, Simple Tabbouleh, and Roasted Garlic Hummus would also be great pairing options. 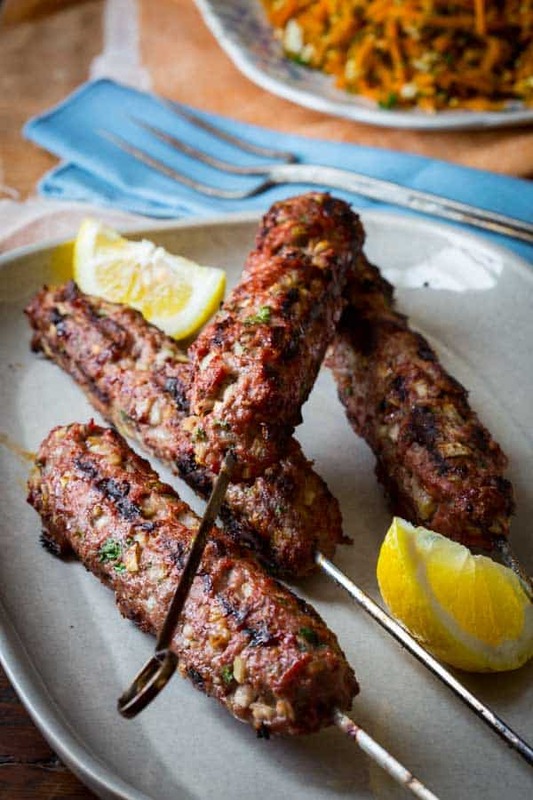 Grilled lamb kofta made with onion and spices and then shaped and skewered onto kebabs. A grain-free and paleo entree for spring grilling season. Mix onion, garlic, parsley, salt, pepper, cinnamon, allspice and cloves in a medium bowl. Add lamb and gently knead with clean hands to combine, about 1 minute. Divide into 4 portions. Shape each portion into a 8-inch sausage shape. Thread meat onto a heavy metal skewer. Oil grill rack. Grill kebabs, turning every 3 to 4 minutes, until cooked through, 9 to 13 minutes. Let rest on a cutting board for 4 minutes before removing skewer and slicing. Here is one of the original images associated with this post. 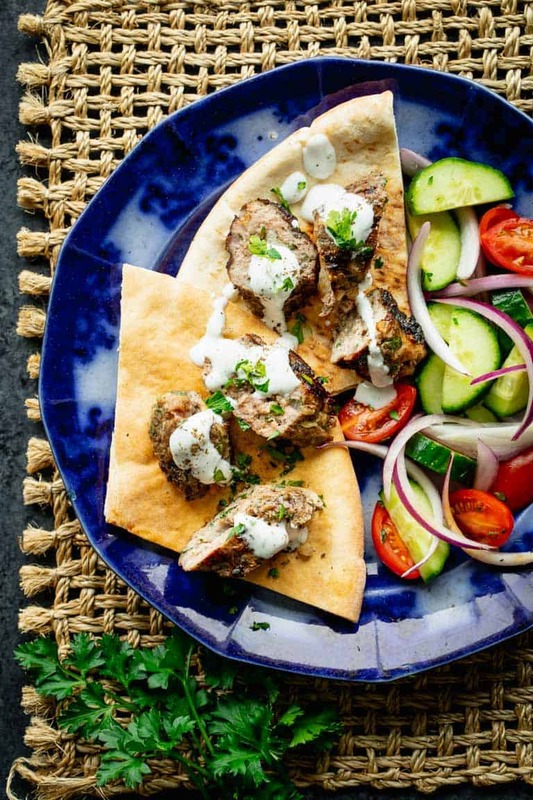 you rule breaker you… i’ve been totally intrigued by kofta lately, and this looks so very doable. glad you found the recipe! Yeah me too!! it is a flavorful way to use lean ground meat and it can be totally grain free. Glad you’re okay with the slip and I am glad to have shared this recipe finally! Oh no! With your bills? That is so funny! I love the idea of binders instead of piles, though that may be too out of site for me. Thanks for visiting today Kalyn. Thank you so much Kalyn! 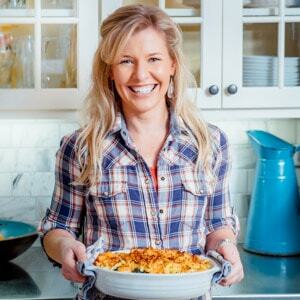 I love your healthy round-ups and it is such a treat when you feature one of my recipes. Clicking over to check it out. Hi there. I would like to make this in the oven. Can you recommend the cooking time and heat level? I’ve been wanting to try lamb for quite a while. This looks like the perfect recipe to be our test run! I grew up eating it, so it’s always been a favorite of mine. Hope you enjoy it! Looks like this one is a meal to try! Thanks for sharing your helpful hints to make it turn out perfect! This is a good one to try for sure. Let me know if you do! Have to try this delicious recipe. Looks perfect and delicious and amazing to make it for my family. I made a leg of lamb last weekend for dinner and we’ve been eating lamb all week as a result. A shame because your kofta looks wonderful. Pinning it to make for later… I’m all lambed out now! Hey Lisa, How are you? I love having leftover leg of lamb. My mom always made lamb croquettes with it. Or her fabulous lamb and barley soup. So good! This grilled lamb recipe is so perfect for spring — love it! Spring is great for both! I agree! So much flavor and such an easy recipe! I seriously love this! I am so thrilled you liked it! That’s awesome Kim! What a special seasoning blend! These look amazing! I love the warm spices too. They really make it taste so good. Well this just looks so easy, not to mention delicious. Those grill marks always make me happy! It certainly is pretty easy, but you would never know by the taste of it! I also enjoy lamb kofta. It’s my first experience cooking with lamb, and you just reminded me of how amazing it was. I will try your version and adding extra tomato on mine. Hi Linda. I am thrilled to hear this caught your eye. Can’t wait to hear how it comes out! 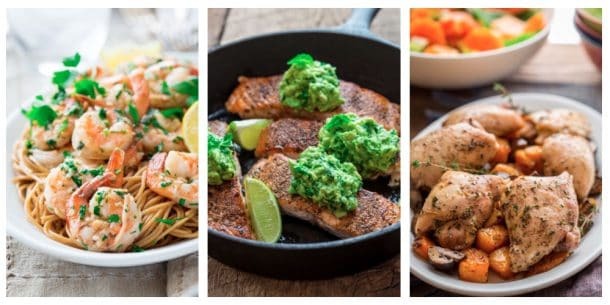 These mediterranean flavors were speaking to me so I got all of the ingredients and made your recipe! Was so delicious! This is getting me so excited for grilling season. I love lamb and I can’t wait to make this. This lamb looks SO good! It will help me learn to grill better and more often too; thank you! Can’t wait to make! These are perfect for the grill and so full of flavor! Yummy! Appreciate that these don’t have any bread filler products to bind! AND, I think kids will love! I’m so excited that it’s warming up again which makes grilling so much easier and these look so flavorful and delish! This is such a delicious way to enjoy lamb! I loved the spices in these kebabs – they added so much flavour!